An activity centered on beads and clay modeling to create a tablecloth decoration that may be personalized. Here we show you 4 different models in different styles and colors. For how to make Fimo clay beads, see the page technique for creating a marbled effect with Fimo. Our model with more than a touch of the 'lucky charm' about it... A mass of tangled up rings, together with fimo beads and hanging lucky charms. 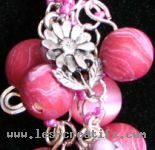 The beads are made from red, white and glittery violet Fimo clay all blended together, which gives this pink marbled effect. After making holes in the beads and baking them, they are threaded onto eyepins: a ring from which the decoration will be hung is made with the help of round nose or snub-nosed pliers, the other end of the decoration may be rolled back on itself for a pleasing effect (it's easier if you're not dealting with a head pin). Fasten on metal charms as well, along with a loop of teardrop beads in matching colors. The extra touch : Thread a pink metal seed bead onto each ring. Make wide holes in the Fimo beads to allow for the passage of a shoelace or cord. Tie knots on both sides on the beads. The extra touch :sand-colored little beads like boomerang-shaped bones for a more 'ethnic' look. This is our most ... Ocean-going model.... Silver glitter and blue marble effect Fimo beads are threaded on with crystal teardrop beads and "rounded bicone beads". A crimp bead enables the design to be attached to the clip. The extra touch : A short eye pin is placed into the large bead, which is then baked (the Fimo clay sticks to the metal during the baking). Make wide holes in the Fimo beads to allow for the passage of a shoelace or piece of cord. Tie knots on both sides on the beads. The extra touch : copper seed beads that match the Fimo beads.